Man is made up of 37 trillion cells. 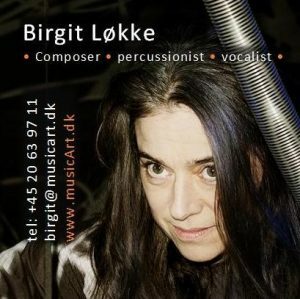 Inspired by past times holistic science tradition Danish composer and percussionist Birgit Løkke unites research, technology and art in a unique study of microbiological processes, opening an unknown universe of sound from the body’s interior. And unfolding the mysterious inner universe of our bodies in sound, images and dance. CELL explores the relationship between life, movement and sound. All living things are in motion, and everything that moves makes a sound. How does it sound when a cell divides? How does it sound when the DNA makes a copy of itself? And do cancer cells sound different from healthy cells? These are some of the things being investigated, exposed, processed and fed through CELL. In the ongoing research Birgit Løkke has visited the Pasteur Institute in Paris and is using test-microphones from Danish developers, G.R.A.S. Sound & Vibration. She has collected information about the communication and microbiological processes in cells. In collaboration with Professor Jan Larsen from DTU and his students, the graphical material as well as “wave signals” will be transformed and processed into audible frequencies. Along with artists working in the visual and choreographic field Birgit Løkke has transformed the recorded material into music, images and dance; a unified musical drama of 50 minutes’ duration. For further emphasizing the theme of the work, the audience and all the performers is gathered in a large indoor tent: a room within a room, created from the dimensions of a cell. Filmed sequences of microbiological processes is projected onto the ‘cell membrane’ to comment on the dancers on the stage itself. Thus the choreography conveys a spatial and visual interpretation of the cells movements. The audience is also contributing to the overall sound. Returning common tonal sound sequences,where all the voices concur, and provide a sense of harmony, vibration and communication. In this way, the audience will mirror the cells movements and communications. One success criterion will be that art and science can once again find itself in a natural and creative interaction in which art makes scientific considerations visible and concrete. In this way, the results can be comprehended and sensed. The further ambition is to open up another layer in the music universe, an as yet unexplored universe. Hopefully it will give us new knowledge, new insights and new music. CELL is supported by The Danish Art Council.